At the Blue Mountain Bistro we always want to give you and your family – dogs and cats included – the ultimate best in healthy foods! Did you know that raw food diet for dogs provides double the nutrition of any canned or dry food? It is not measured by the descriptive label on the package, it’s obvious in the absorption of their food. Dogs and cats are NOT humans. They have a very different digestive tract and process. We can get very sick from raw meat, while dogs thrive on it as their natural diet. Compared to us, dogs and cats have a very short digestive system, which means that foods are processed quickly — before harmful bacteria have a chance to multiply and cause problems. Also, carnivores have a very high level of acidity in their digestive systems. This high acidity allows them to break down the nutrients in raw meat and bones, and is also hostile to bacteria. A raw food diet consists of good quality, USDA-inspected and approved meats and bones. Cats and dogs are carnivores (or meat eaters). Yet all dry commercial pet foods are at least 60% (or more) grain because the carbohydrates are needed to hold the food together. Does it make sense to feed our carnivores a diet that contains at least 60% of a substance they don’t need? Additionally, carbohydrates are metabolized by the body to glucose (sugar) which is known to feed cancers, diabetes and many other disorders that now plague our companion animals. Raw diets simulate the menu that nature intended carnivores to eat. When a carnivore eats an herbivore (like a rabbit) the carnivore eats some meat, some bone, some organ meats (liver, heart, kidney, etc) and some green vegetation contained in the herbivore’s digestive tract. That’s natures’ perfect meal – the meal that raw diets replicate. Beef and Broccoli is 75% beef, antibiotic and hormone free beef – the same ground meat that we eat! The color appears to be a greenish-brown due to the grinding of the broccoli and the juices that are released into the meat. Beef, Liver, and Yam is 50% beef, the same beef but the overall formula is less expensive because there’s a lower percentage of meat and additional less expensive organ meat. Butchers Blend 100% is exactly that – not a blend at all. It’s 100% meat – human grade meat – to be offered by a small local butcher. It’s great for dogs and cats. The beef flavor contains no bone. All Butchers Blend products contain NO additives or preservatives. This combination offers optimum levels of amino acids, protein, essential fatty acids, naturally occurring enzymes and the necessary vitamins and minerals that are the building blocks for your pet’s healthy biological functions. All of our ingredients come from suppliers recognized for their superior quality products and the highest standards of safe food handling for humans. Every ingredient in our formula will provide your pet with essential nutrients they need to build and maintain healthy immune, circulatory, nervous and digestive systems. 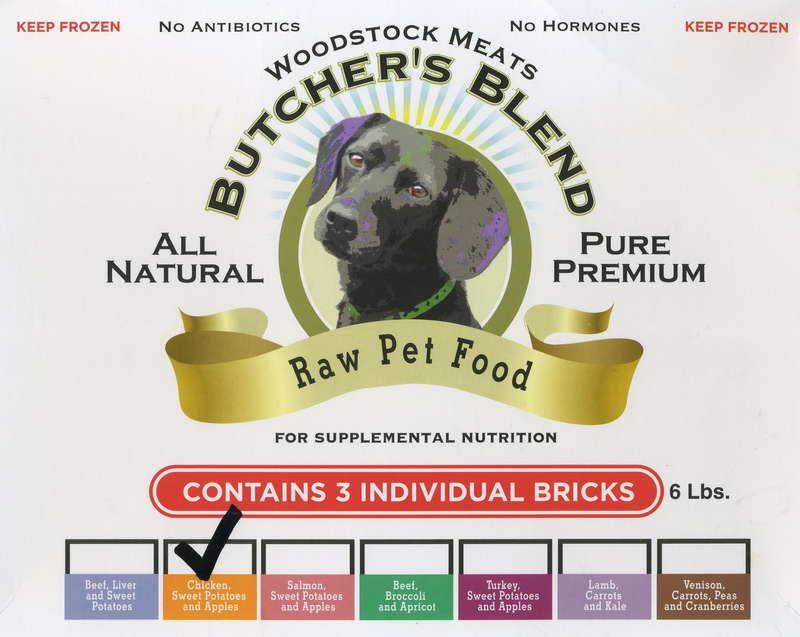 The benefits of Butcher’s Blend raw pet food are better health, more energy, less allergies, cleaner teeth, shinier coat, less odor, and a longer life. Flavors available are: Beef, liver, and sweet potato; Chicken, sweet potato, and apples; Salmon, sweet potato and apples; Beet, broccoli, and apricot; Turkey, sweet potato, and apples; Lamb, carrots, and kale; and Venison, carrots, peas, and cranberries. Oh, did I mention that the mastermind behind this whole project is Kevin Christofora? One of the owners of Woodstock Meats – hats off to you Kevin! What’s not to love?! I can testify that the very first day I fed this food to my black lab Molly, she ran around the room doing circles for a few minutes! One of her sure signs of being extremely joyous!